This two-story, T-plan residence is considered “Michigan’s Prairie masterpiece.” The house features pale brick, a hipped roof, lean masonry masses and long broad eaves. It is carefully sited to allow maximum southern exposure for the living room windows and skylights, and to create a spacious yard for the perennial gardens. Each terrace and art glass window is carefully arranged to bring nature into the house wherever possible. Wright’s characteristic attention to detail and visual unity is particularly apparent inside, where much of the space is defined by built-in cabinetry and geometrically patterned screens. Art glass windows, ceiling panels, and lanterns play off of the gold glass used in the mortar joints of the fireplace to create a completely light-filled space. Significantly altered in 1922, the home fell into decline following Meyer’s death in 1936. 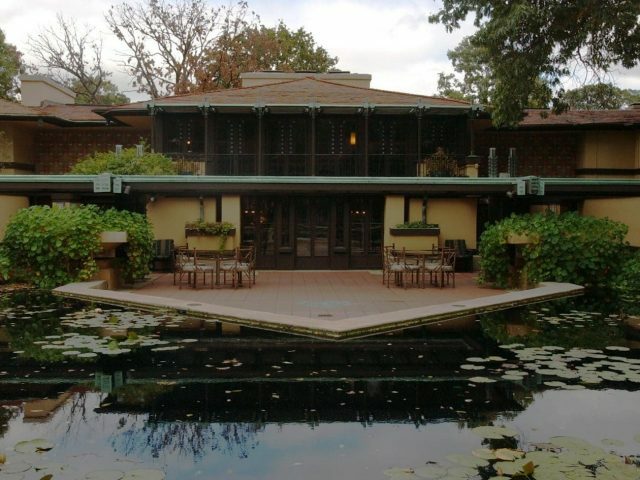 In 1985 Steelcase, Inc., the manufacturers of Wright’s Johnson Wax furniture, embarked on a two-year, museum-quality restoration of the home and returned it to its original 1910 condition.